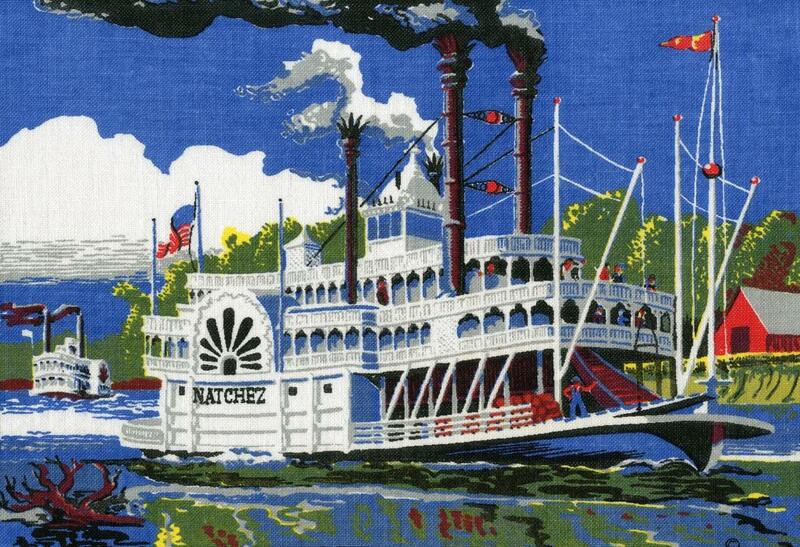 9 x 12 inch pictorial area of a "tea towel" depicting a sidewheel NATCHEZ by artist Robert Hughes circa the early 1950's, printed in primary colors on pure linen fabric by "Kay Dee handprints" of Rhode Island giving the illusion of it being embroidery or tapestry. 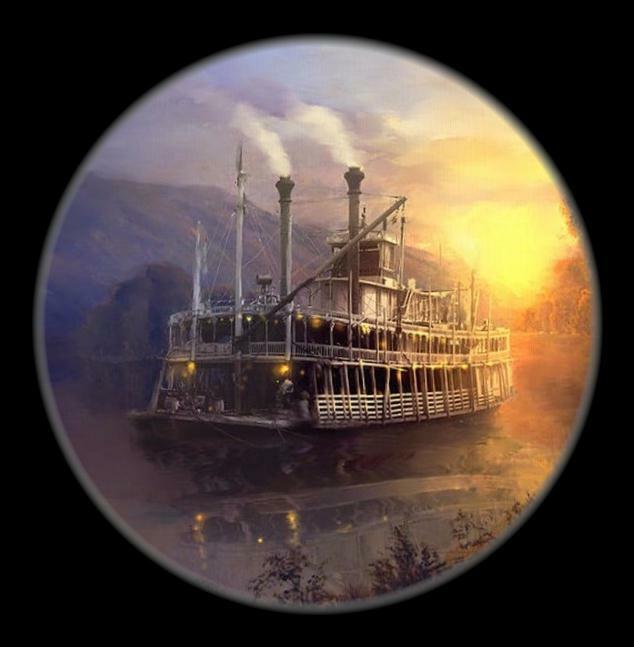 Hughes was influenced by Paul Detlefsen's nostalgic color lithograph "Riverboat Days" of a steamboat he called the GARY WAYNE. which was stylized and compressed here by Hughes, and even includes Detlefsen's red barn on the far right from which can be seen with "Riverboat Days" on Illustrations page 21. The far left steamboat in the distance and snag lower left corner were derived from a Currier & Ives 1860 lithograph "Wooding Up on the Mississippi which can seen on Currier & Ives Illustrations Page 1. An interesting image retrieved from internet I straightened it up and brightened it then put it inside a circle vignette over black. Nice color, evidently based on a vintage black and white photo. I think it's a "kit" that can be assembled by crafters with "sparkly" materials. Attached photo of an Extra Large maritime style coat posed with Jim Hale's steamboat model and the five foot wheel from the little towboat BLUE WING. 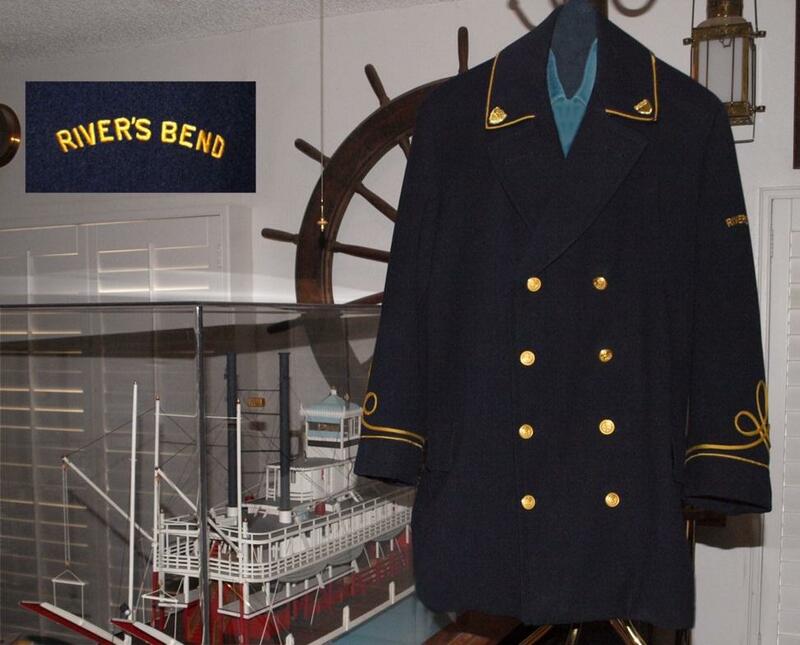 The name "RIVER'S BEND" is embroidered on the left sleeve, most of the word RIVER is visible on the left sleeve on the right side of the picture and I added a close up detail photo of the embroidery in the upper left corner. It's navy blue wool and heavy like a pea coat. Had it restored and the lining replaced and also upgraded the generic buttons with actual Coast Guard uniform anchor buttons and had vintage uniform shields sewn to the collar. The whirly-gig design above the cuffs suggests that this may have been intended for a musician or a cadet in a maritime academy. Unfortunately the sleeves are a couple of inches too short on the coat for me to wear it although it fits fairly well through shoulders and chest. Will use this probably as display in a mock up of a pilot house. There are a number of "River's Bends" listed online but there are very few that seem to be likely candidates as origins for where the coat originated. Could have made for a doorman to wear at a swanky restaurant or a resort hotel. Hope someone sees this who will recognize the coat and be able to tell me more about it. Attached is a circa 1950's "silk fabric" necktie using a 1928 photo attributed to Ewing Galloway of the AMY HEWES on Bayou Teche as the main point of interest.The designer added color and additional Spanish moss hanging from trees above and a photo of cotton bales piled up in the foreground. The photo of the AMY HEWES also provided the inspiration for the January, 1934 cover of Motor Boating magazine in which artist Carl W. Bertsch changed theangle to an overhead point of view. 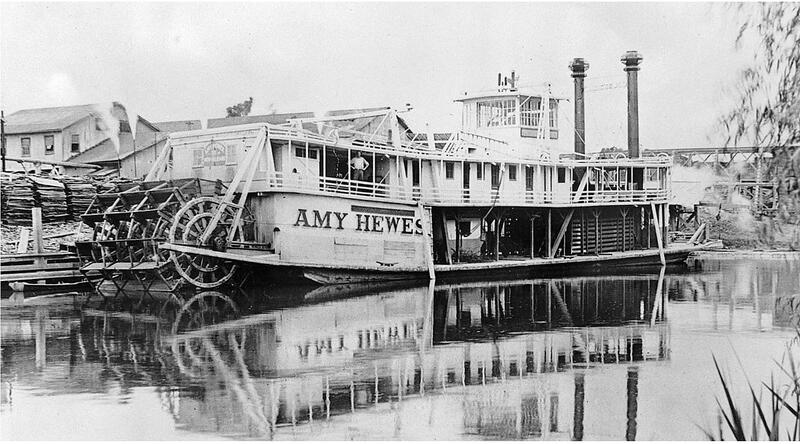 Artist Jack Woodson based a the stern on his painting of the "WHIPPOORWILL" on the AMY HEWES. I first saw the necktie when visiting Keokuk where Bob Miller was wearing one at a Midwest Riverboat Buffs gathering aboard the GEO. M. VERITY. For many years Bob and his son John were curators aboard the Verity. I finally found the same tie years ago on eBay. I had it matted and framed. Two photos of the boat depicted on the tie. Fred Way in his Towboat directory - T0127 described her as "A fine little towboat with pilothouse on the roof." 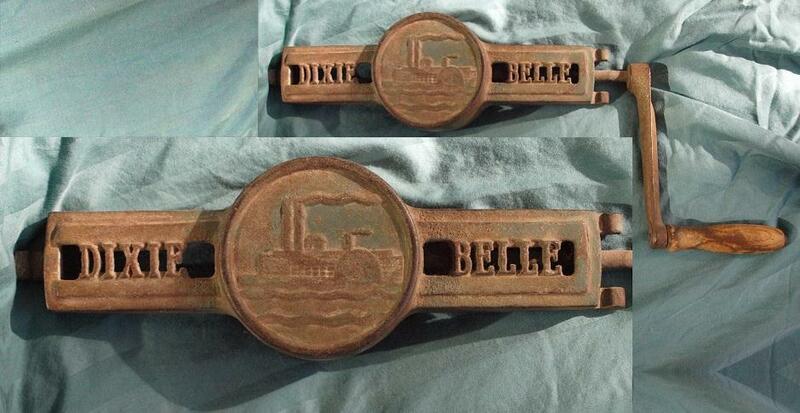 Vintage Dixie Belle Ice Cream Maker made of cast iron 12" long x 2" wide x 1 3/4 inches deep. Circle vignette of the steamboat at center is 3 3/4 inches in diameter. This item would have been clamped across the top of an approximately 16 inch tall wooden bucket. Made by Woodenware Richmond Cedar Works Manufacturing Corporation of Richmond, Virginia. An intact version of this ice cream maker with wooden bucket was listed by NewLife4OldTreasures on Etsy in December, 2017). etsy.comI've had the mechanism in the attached photos for many years and finally got around to photographing it today. 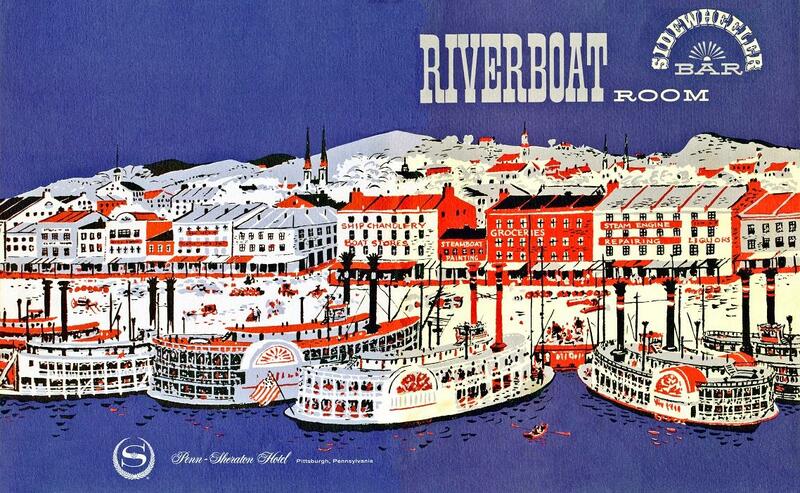 Front and back cover of a menu circa the 1960'a from Pittsburgh, Pennsylvania Penn-Sheraton Hotel's Riverboat Room and Sidewheeler Bar. The artist based the waterfront commercial buildings on 1848 panoramic daguerreotypes taken of Cincinnati, Ohio riverfront. Steamboat/Maritime references inside the menu include "Riverboat Casserole Specialties" and "Dine while STEAMIN' ROUND THE BEND." Bargain prices from the 20th Century: N.Y. SIRLOIN, Mushroom Cap $5.95 is the most expensive entre; RIVERBOAT ICE CREAM PIE 50 cents. 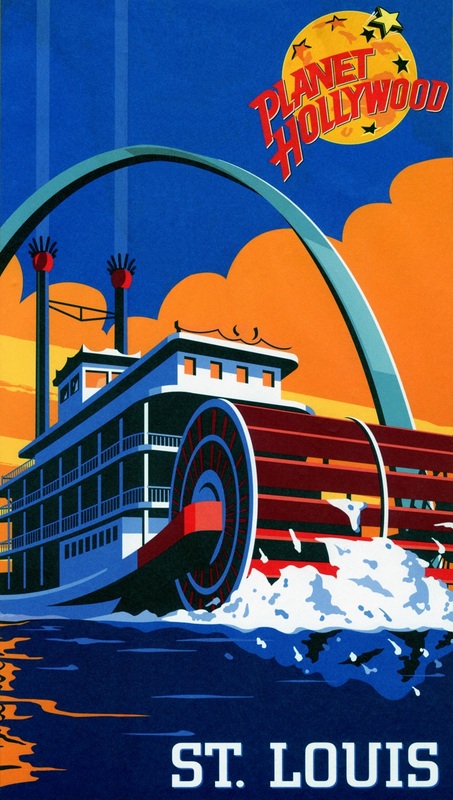 Super bright colors, stylized "poster" design graphic for the front of the 2002 alcoholic drinks menu from the "bar/club" Planet Hollywood franchise in ST. LOUIS featuring a sternwheel "riverboat" as seen from a low angle point of view and the Gateway Arch looming in the distance. There was a patterned margin in 4 colors which I did not include here because there were problems to do with the condition so I concentrated on restoring this central portion which measures 6 3/4 by 12 1/8 inches. The construction of the Gateway Arch, close to the Mississippi River short in St. Louis, began in February 1963. It was completed in October 1965, and cost less than $15 million to build. With foundations sunk 60 feet into the ground, its frame of stressed stainless steel is built to withstand both earthquakes and high winds. An internal tram system takes visitors to the top, where on a clear day they can see up to 30 miles across the winding Mississippi and to the Great Plains to the west. In addition to the Gateway Arch, the Jefferson Expansion Memorial includes the Museum of Westward Expansion and the Old Courthouse of St. Louis, where two of the famous Dred Scott slavery cases were heard in the 1860s. MENU - circa 1864 bill o' fare for the ADAM JACOBS. Damned expensive but fulfilled a life long ambition to own a sure 'nuff steamboat bill o' fare. Inside the date and some of the courses like desserts are left blank so someone on board must've used a letter press to complete the "form" each day. SW p wh b. Brownsville, Pa., 1864. 231 x 36 x 6. Engines 26's- 7 ft. Four boilers. Was in Gen. Grant's fleet on Tennessee River. Named for Capt. Adam Jacobs, Brownsville, Pa. Machinery built by John Snowden & Son, Brownsville. 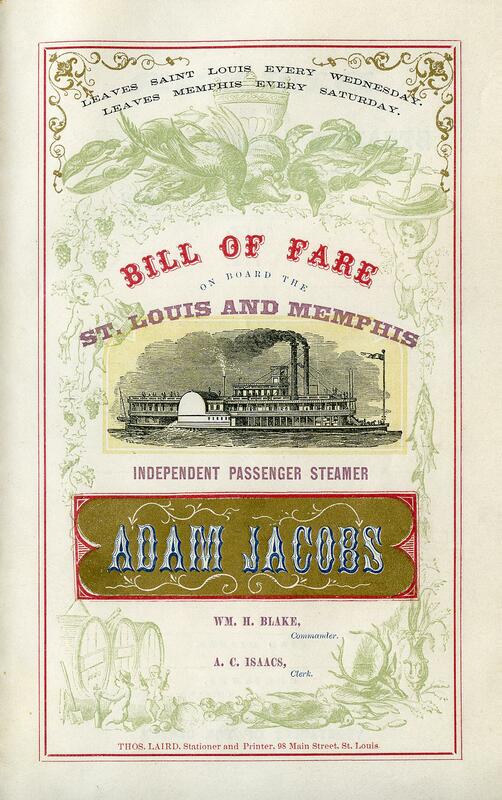 Entered St. Louis-Memphis trade as an independent boat, September 1864. Became one of the early Anchor Line fleet. Dismantled in 1874 and machinery went to STE. GENEVIEVE of the Anchor Line. 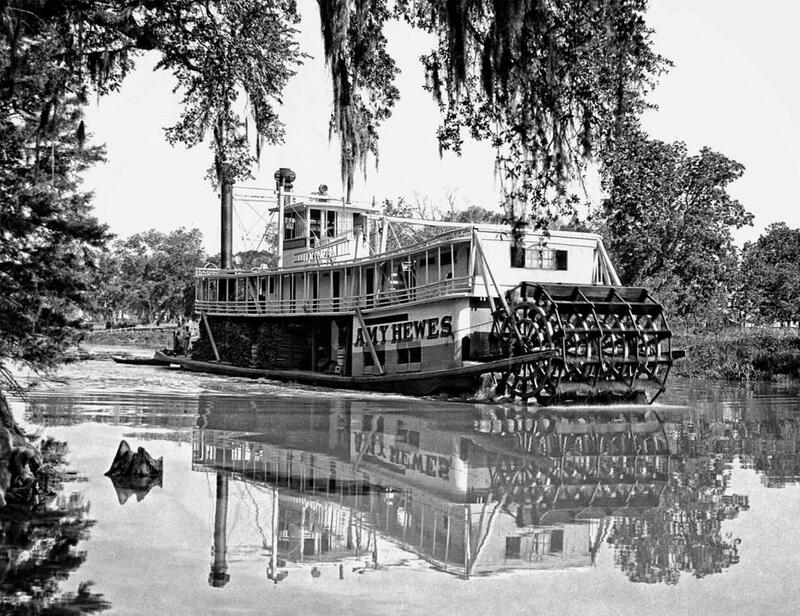 The crew and officers of one of the tinseled river steamers had been noticing something they could not explain. In one of the best cabins, nearly two months earlier, an elderly, jovial-mannered individual had taken passage at Natchez. Arriving at New Orleans, he announced that he would not get off, but remain until they reached St. Louis. At St. Louis he gave notice that he would stay on until they arrived back in New Orleans; and so it went. The old fellow wasn't a gambler; that they knew, because they could spot the brotherhood a vessel's length away. He wasn't a thief or a murderer; he smiled along, talking, offering cigars, buying toddies, sitting around with the rest of the passengers. Still, they were disturbed by this phenomenon. Finally the captain had to do something. With several mumbled apologies, he brought up the subject. His guest's answer became historic. "Of course, sir, I'll tell you." "It's the finest way to pleasure myself that I know." "No hotel in America can equal this." "The finest food—your wild game, your glazed fish, your roasts, sauces and pastry!" "My cabin—it's as finely equipped, as well decorated, as any room I've enjoyed in my life." "The bar, the cabin, the promenade—nothing to match 'em, I tell you." "And the company! I meet all my friends, the best people in the world." "Why should I want to leave?" The captain, pink with pride, bought the man a drink. The incident went the rounds, but the explanation brought little surprise. Everybody agreed the man was right.